The Pepper-Bark Tree is an evergreen which grows between 5 and 10m tall. It is found in forests in Southern Africa. The inner bark has a pungent peppery smell giving the tree its English name. Crushed leaves of this tree also have a distinctive bitter taste allowing for easy identification. It is widely planted as an ornamental tree. The name ‘salutaris’ means health giving, referencing its medicinal properties. The bark is used to treat complaints such as malaria, stomach ulcers, colds and nightmares. Cooked roots of the tree are used to treat coughs and the leaves to alleviate skin irritation. It is also used for timber, as a chilli substitute and is eaten by hippos. The majority of bark in the medicinal trade is harvested from wild individuals and to an extent the tree copes well, vigorously producing coppice shoots and rapidly regrowing stripped bark. However, as the trade in medicinal plants has become increasingly commercialised the harvest has become unsustainable, and W. salutaris is being wiped out across its range: in South Africa, for example, more than half of the country’s Pepperbark trees have disappeared. Relieving the pressure on wild populations is evidently critical for conserving the Pepperbark tree, but populations in protected areas are not immune from harvesting pressure and harvesting bark from cultivated trees, while promising in the long term, is not sustainable until the trees are ten years old. An alternative, thanks to similarities in their chemical composition, is to use W. salutaris leaves in place of the bark – this harvest is less damaging, and provide benefits from cultivated trees too young to have their bark removed. Warburgia salutaris was assessed by the IUCN as Endangered in 1998 because of its small distribution and low abundance. It is threatened by harvesting for medicinal use as well as land-use changes, with towns and agricultural land expanding into the forest. The tree is also exploited for its timber and used as firewood. It is a slow growing species in the wild, increasing its susceptibility to overharvesting. 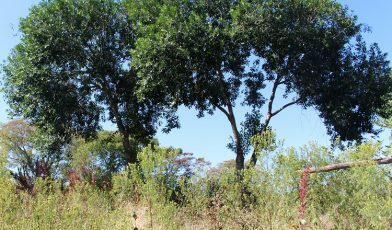 Despite its endangered status, the Pepper-Bark Tree is already Extinct in the Wild in Zimbabwe and is considered Critically Endangered in Swaziland.